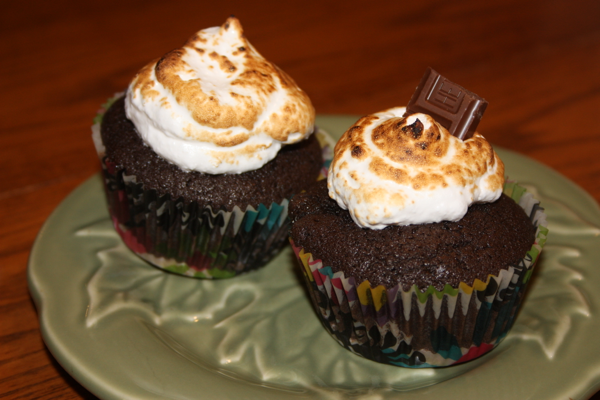 I am honored to be guest posting on Frosting for the Cause today. Frosting for the Cause is a blogging project bringing together bloggers from across the US and Canada to help provide awareness about cancer, support efforts working to finding a cure, and brighten someone’s day by offering our baked goodies to those being treated or those who are working with cancer patients. 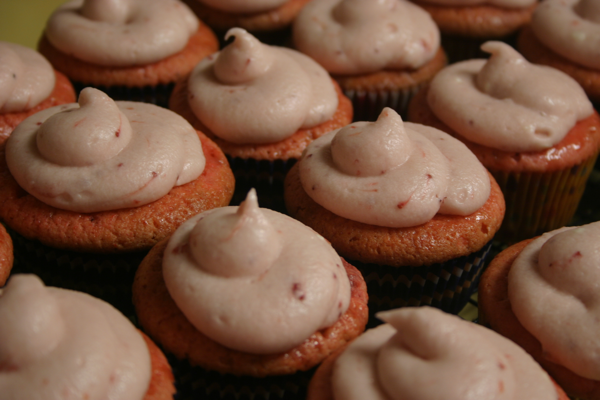 I first heard about “Frosting for the Cause” through Aimee’s blog Under the High Chair. As soon as I read the post, I knew I wanted to be a part of this amazing group of ladies and this wonderful cause. I immediately went to the Frosting for the Cause site and signed up. I was so excited! Unfortunately, I feel like I’ve already had too many dealings with cancer, and I am only 33. When I was a senior in high school, my mother was diagnosed with liver cancer. I was devastated. My mom underwent chemo and had a resection of her liver (they removed a large part of it). She made it through, but once cancer has entered the picture it is always in the back of your mind. You always wonder, “Will it come back?” Unfortunately, it did come back. We were blessed that she had 10 wonderful years between my mom’s first diagnosis and the return of her cancer. My mom was able to share in lots of events that I wasn’t even sure she would be around for when she was first diagnosed: my high school graduation, my wedding, and the birth of my son William (her first grandchild). My mom was so excited to meet her grandchild and even hopped on a plane when I was headed to the hospital to deliver. She made it just in time! I didn’t know at the time, but in all my excitement of having my first child mom was dealing with the possibility that her cancer had returned. Several weeks after William’s birth, mom returned for the celebration of his baptism. She arrived a few days early to “help me get things in order.” It wasn’t until she arrived that I found out the real reason she arrived early. She came to tell me that her cancer had returned. I was in shock once again. I will never forget that moment. Not only had the cancer returned to her liver but it also had spread to her lungs. I spent the next year traveling between Kansas City and Tennessee. I wanted to ensure that she spent as much time with her grandson as possible. We were there beside her during chemo treatments and experimental procedures. It was a trying time, but she had her sweet grandson beside her. Mom even made it to William’s first birthday. Unfortunately, she did not make it to the birth of my second son, Tyler. She knew he was on the way though and told everyone that she met about her grandchild on the way. Mom passed away in March of 2004 just a couple of weeks before she would have celebrated her 57th birthday. My mom left me with a wonderful legacy. 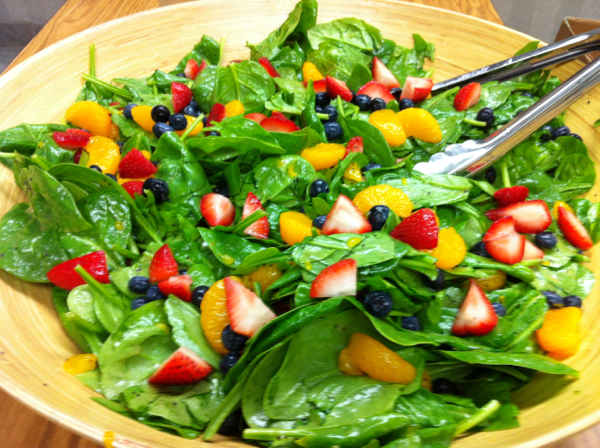 She loved food and sharing it with others, which is why I began blogging. I wish she were still around to be a part of this experience with me. (My husband often tells me that she would have been proud of my blog.) So, in honor of my mom, Elizabeth Harrell Hensley, I am making Strawberry Cupcakes. She was an amazing lady and I know she would approve of this wonderful project though I’m sure she would be sorry that she couldn’t sample all of the wonderful recipes being shared. This project combines two of her passions. She loved goodies of all kinds and was hardly ever without some sort of treat in the house. She also regularly worked to do fundraisers for combating Breast cancer. I’m sure Mom would have approved of this recipe (which is my husband’s great-grandmother’s favorite cake), and I count it a privilege to donate these to KU Hospital in her honor. 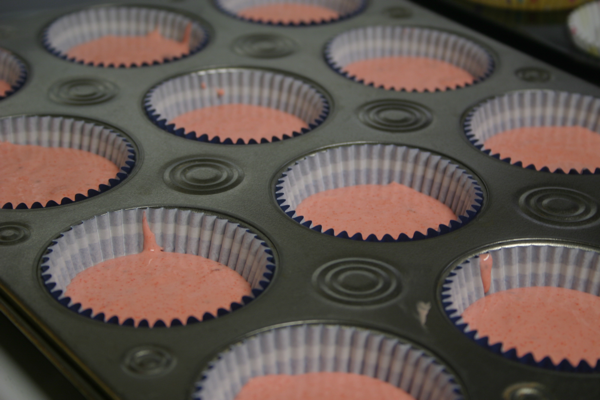 ½ cup strawberries from 1 box frozen strawberries, thawed and drained (juice reserved) You will use the remainder in the frosting. Preheat oven to 350 degrees. 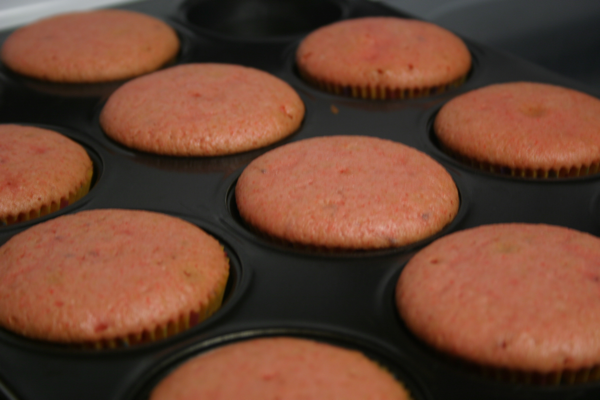 Line cupcake pans with cupcake liners. Dissolve strawberry gelatin in ½ cup cold water. 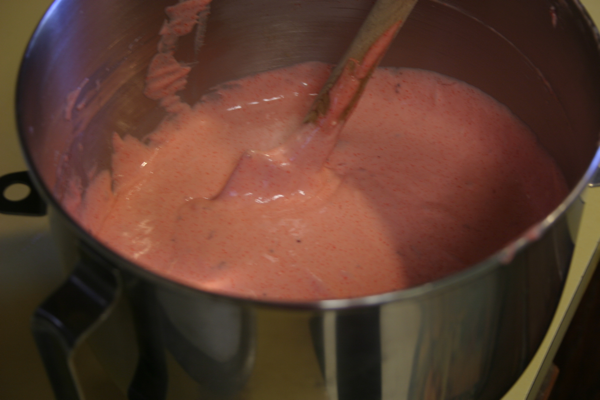 Combine cake mix, eggs, canola oil, ½ cup strawberries, and dissolved gelatin in a mixing bowl. Mixing thoroughly. Bake for approximately 20 minutes. Remove cupcakes from oven. 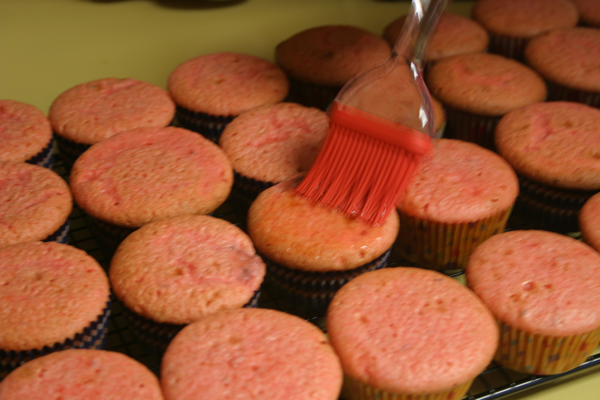 Brush cupcakes with reserved strawberry juice. Let the cupcakes cool. Once the cupcakes have cooled frost with frosting. I combined a cream cheese frosting I had on hand from a previous cupcake recipe I had made earlier in the week with the strawberry frosting. 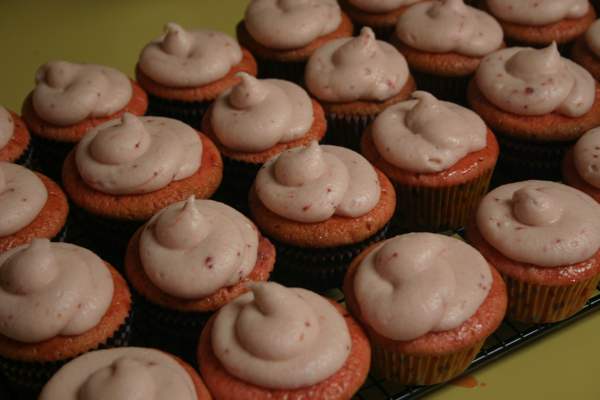 I loved the combination of the strawberry frosting mixed with the cream cheese frosting but either frosting would be excellent on its own. 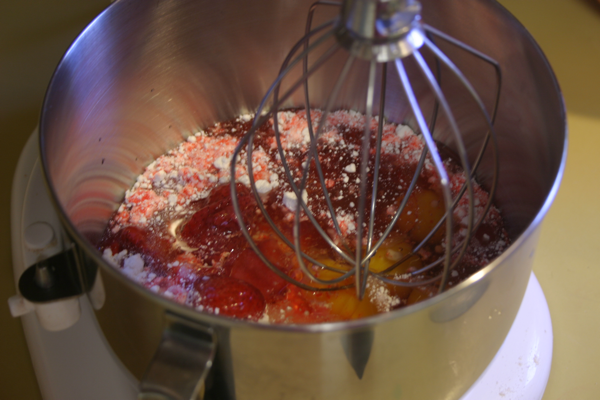 Combine strawberries, powdered sugar, and softened butter in the bowl of a stand mixer. Mix on low to incorporate the powdered sugar increasing speed to create fluffy smooth frosting. Add vanilla and beat until incorporated. Beat all ingredients together until fluffy. 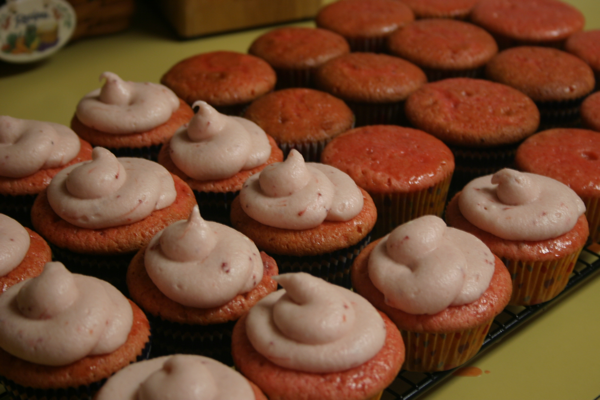 10 Comments on "Frosting for the Cause: Strawberry Cupcakes"
Dinah, that is a lovely tribute to your Mom. She was all you said and more! She was very proud, and rightfully so, of you and Proctor and I know she would love all that you both are doing and being. Keep up the good work, you are building on a strong foundation and increasing the legacy to hand on to your children. I am blessed to have known Elizabeth Hensley, and blessed to know you!!! MMM. I just ate one and they were awesome! Thank you. It makes me very happy to hear people enjoy my ramblings. Thanks Ali! If I was on top of things I would have sent some to Austin for his birthday. Aunt Dinah owes him a goodie when I come to town. Thank you so much Marilyn! You are quite the lady yourself. Love you! Hi Dinah ~ I can’t tell you how much I appreciate you joining this project. You Mom would definitely be very proud that you chose these delicious looking and family favorite cupcakes to honor her in the wonderful manner you did today. Thank you for sharing your personal story with us and for helping to bake a difference.